Here you can find eyewitness accounts of events large and small that have shaped British history. From Julius Caesar’s arrival, through to later Anglo Saxon and Norman invasions,and on into the medieval and modern eras, these are the authentic voices of the men and women who experienced life in these islands at first hand. Or a personal favourite: Karl Marx on a London pub crawl. “Gladstone and the franchise for 2 millions”. 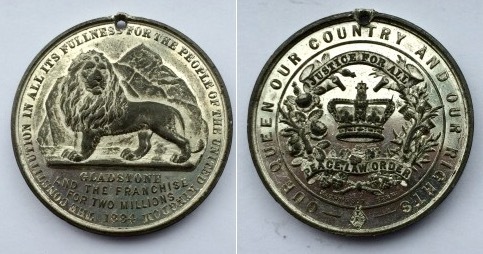 Medal commemorating the extension of the vote to many working men in 1884. Women had to wait until at least 1918 and in many cases until 1928 to vote in parliamentary elections.